Our next X299 motherboard review shrinks down from the large ATX and E-ATX sized motherboards to the sole Mini-ITX offering for the X299 platform. 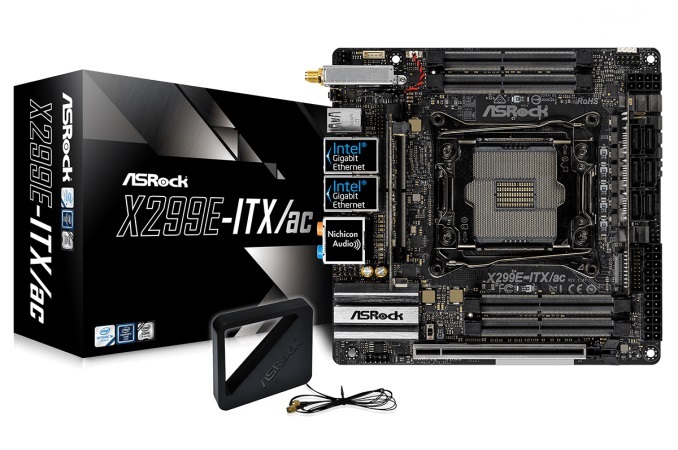 The ASRock X299E-ITX/ac is a diminutive board that offers nearly all of the same features as its larger counterparts but in a package well suited for SFF systems. Users will find four SO-DIMM DRAM slots for quad channel operations, dual Intel NICs, six SATA ports, three M.2 slots (! ), plus integrated Wi-Fi and Bluetooth capabilities. The ASRock X299E-ITX/ac is currently the only available Mini-ITX board for the X299 platform. EVGA, MSI, and ASRock do offer MicroATX sized boards, but none are like this. Typically with Mini-ITX boards, their small dimensions yield an obvious lack of real estate for adding functionality. In order to squeeze more out of what was available, motherboard manufacturers have had to be creative, and often built up (quite literally). For example, additional slots on the motherboard to go vertical. On the X299E-ITX/ac, this means an extra daughterboard slot just behind the back panel IO, and a second on the opposite side of the motherboard. The first pairs a riser card with a single M.2 device, and the second holds a storage array setup. This latter module holds the six SATA ports, as well as external USB 3.0 and USB 2.0 headers. Curiously, that card is large enough to cover the VRM heatsink, which might hinder air flow to the area around there. One of the other major space saving design choices used here is to locate two M.2 slots on the back of the motherboard. Impressively, three M.2 slots, four SO-DIMM slots, and six SATA ports all manage to find a home on a tiny motherboard. The feature set it brings to the table on such a small platform is impressive. However, that creativity will fetch a premium price. Currently selling for $399 on Newegg.com, it places the X299E-ITX/ac in the high-end segment as X299 motherboards currently top out at $499+ and have a floor of $209. Pricewise, this places it in the crosshairs of the GIGABYTE X299 AORUS Gaming 7 ($399), ASRock X299 Gaming i9 Professional ($389), MSI X299 Gaming M7 ACK ($379), and the ASUS ROG Strix X299-XE Gaming ($369). Most of those boards have three M.2 slots and six or more SATA ports, however, it would be near impossible to shoehorn an ATX sized board in a SFF case - heavy modifications notwithstanding. In the MicroATX world, the EVGA Micro is $289 with only one M.2 slot, while the dual M.2 slot MSI offerings are still to be released in North America. In other words, there isn't competition in the space as there are not any other boards this size currently found on the market. One of the main concerns about going to such a small motherboard is the loss of certain features to which the X299 platform provide. In previous HEDT mini-ITX motherboards, for example, users were limited to two memory modules and dual-channel operation, as seen in our review of the X99E-ITX/ac a couple of years ago. For this board, ASRock has put SO-DIMM memory on instead, offering quad-channel DDR4-4000 support up to 64 GB. This isn't the full 128 GB of most X299 boards paired with Skylake-X processors, but does give full bandwidth. The other element of loss is on PCIe. For chips that have 28 or 44 PCIe lanes, having only one PCIe x16 slot is a bit of a kicker. 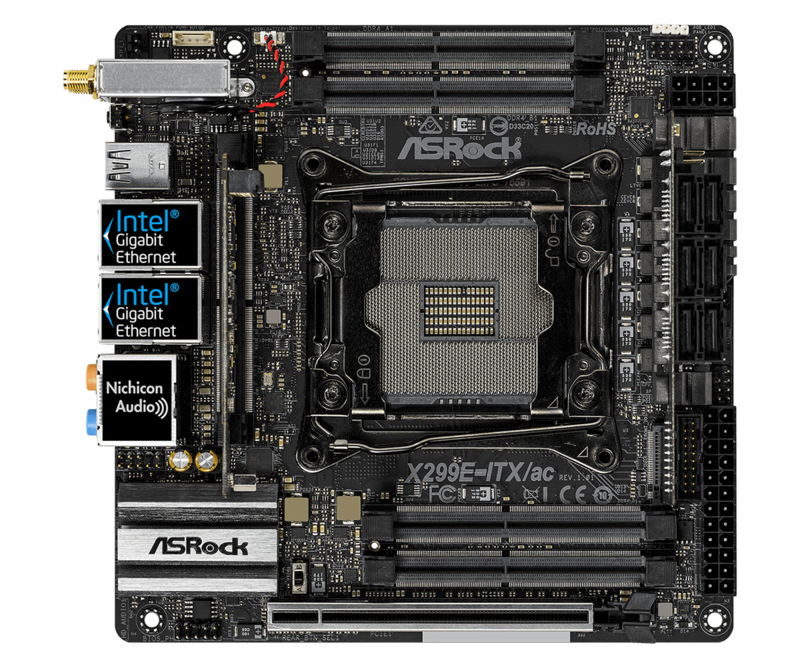 To that end, ASRock has placed three M.2 slots on the board, and the X299E-ITX/ac comes with one reinforced full-length PCIe slot at x16. There are bifurcation options in the BIOS if a user has a riser card that can split the slot into dual x8/x8, though this feature was untested in the review. This makes much more use of the PCIe lanes than one would have normally expected. On the network side, the board has a 2x2 802.11ac Intel AC 8265 card with wireless speeds to 867 Mbps. Additionally, there are two Intel NICs, an I219-V and I211-AT, for wired traffic. On the back panel IO, USB consists of two USB 3.1 (10 Gbps) ports with one Type-C, and four USB 3.1 (5 Gbps) ports driven by ASMedia chips. Adding to that, on the riser card is are a USB 2.0 header and USB 3.1 (5 Gbps) header managed by the chipset. Finally, audio functionality is carried out by the high-end Realtek ALC1220 codec. Connectivity wise, while the board is has a lot of features, that doesn't go to say there aren't some missing. Front panel USB 3.1 (10 Gbps) support isn't here, nor is the ability to use more than 64GB of memory. Granted, most users do not need it, but the option just isn't there. Six SATA ports can be a limitation for storage heavy users who haven't moved on to M.2, but I'd imagine those who use more than six SATA ports and three M.2 drives are rare in the consumer segment. Overall, the real estate appears to have been used wisely on this densely packed board. In the realm of performance, the board happily trudged through our testing without batting an eye. Multi-core performance was a bit slower than the rest, but this is due to how the board deals with the number of cores and its frequency. Turning MCE on was a different story as it happily turned up all cores to 4.5 GHz and went through the testing suite. The power delivery heatsink was without a doubt warmer than any I have checked while testing X299 motherboards at stock. When overclocking and testing, it was hot to the touch. If the plan is to push a high-power CPU to high overclocks on this tiny board, I would suggest a well-ventilated case or spot cooling on that VRM to keep temperatures low. For our ITX system, a special thanks goes out to GSkill who provided us with new high-speed DDR4 SO-DIMMs. The set they gave us, F4-3800C18Q-32GRS, is not currently found on the website. The 4x8GB kit is rated to DDR4-3800 @ CL18-18-18-38 with 1.35V and supports Intel's XMP 2.0 profiles. 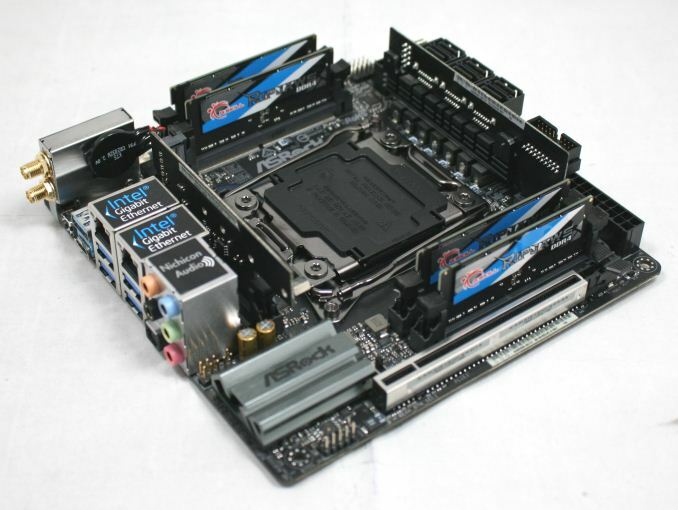 ASRock's previous mini-ITX high-end desktop board, the X99E-ITX/ac, was the first version of this design. It used the 'narrow ILM' version of the LGA2011-3 socket, and due to the limited number of consumer coolers that support that design, they shipped samples with a Dynatron cooler to fit. With this new model however, they are using a full sized LGA2066 socket for normal coolers. That is going to help integrate this motherboard into the builds that need it. Due to Intel's new Xeon strategy, there is actually no increase in thread support from the X99E-ITX/ac to the X299E-ITX/ac. On the older board, it supported the top end Xeon E5 v4 processors, which were available up to 18 cores, albeit at a $4115 list price. The X299E-ITX/ac only supports the Core i7 and Core i9 consumer Skylake-X processors, but these also go up to 18 cores. Except this time, there are four memory channels, not two. Board partners have launched dozens of motherboards on this platform already, several of which we will have an opportunity to look over in the coming weeks and months. This specific review will cover the ASRock X299E-ITX/ac. I've had the ASRock X99 ITX for two years. The sole compromise is literally one PCIe x16 slot, which is all 95% of people in the market for this board need. If you need more, you go ATX. Nobody is building ITX systems with SLI or mining in mind. Nobody. With the exception of maybe one SFX PSU, they can't even drive more than one high end videocard with a platform like this, and if you are using a case that holds an ATX PSU, why are you even considering an ITX board? The whole point of the system is to be compact. "If you need more, you go ATX."